Generally regarded as one of the world's most sacred spots, the Temple Mount in Jerusalem is also the world's bloodiest and most controversial site over which battles have been fought for thousands of years. While the Israelites, Babylonians, Romans, Byzantines, Arabs, Crusaders, Mamelukes, Ottomans, British, Israelis and Palestinians have all clashed over this 'hot spot', its ownership is still being contested. 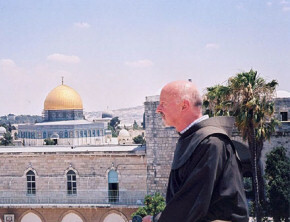 In this two-part series, International Emmy Award winning filmmaker Willy Lindwer attempts to decipher the mystical attraction of this site for the three monotheistic religions, Judaism, Christianity and Islam � an attraction that has made this site, in the words of TIME magazine, "potentially the most volatile 35 acres on earth". The documentaries contain the first video footage shot on and beneath the Temple Mount since the beginning of the Al Aqsa Intifada in 2000. An AVA production in cooperation with NCRV Television (Netherlands) and Noga Communications (Israel).